Co-Captain Kristen with me for this journey to Oklahoma City to buy my new iPod!! That's right! It's FINALLY IN!!! And I have a new email. friedeggspodcast@gmail.com. Enjoy! Sorry about the long length in between our excursions...This time I talk about my constant struggle with the new iPod, video podcasts I listen to and new music to check out! OR GET IT THROUGH iTUNES!! More of some of that. In this episode...find out what podcasts I listen to, hear me almost hit a fox...yes a fox, and more of that random stuff I seem to do so well. Also check out Fried Eggs and Other Small Tragedies through iTunes!! 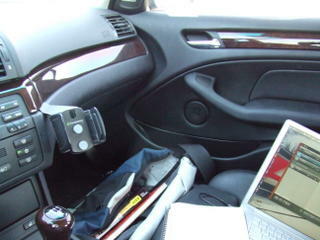 Here are some photos of my mobile studio. Thought you guys might enjoy this! Next podcast coming soon!!!! Here's number 3! Really enjoying the whole podcast thing. Recorded this while I drove to Kansas. 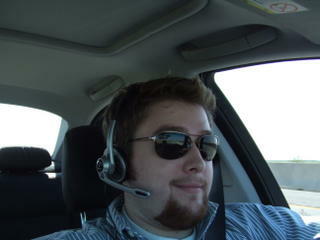 Even at highway speeds you get funny looks with the headset. Hope everyone enjoyed the crazy Kevin podcast the other day. Also....send me listener mail! I would love to have some!!! So here's number two. I AM OFFICIALLY IN THE ITUNES MUSIC STORE!!! The whole podcast is sort of a blur...I haven't slept in 48hrs. so I'm not very cohesive in my thoughts.....but I thought it sounds funny....just because at times I can barely put a sentence together. I'll try to get another one out after I sleep.....so tired. 'Till next time! Tomorrow will bring a new episode. All of my class projects are due tomorrow by 5pm...so after that I'll record a new podcast. Tune in to learn the meaning of the podcast name!!! Here's my RSS feed if you want to subscribe to my podcast. Also you can subscribe now via the iTunes Music Store! Say hello to my first podcast!! !